Garden Passages recognizes that coded door hardware has become extremely popular. 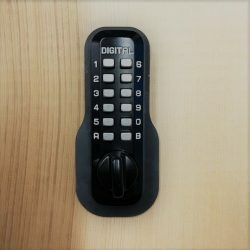 Our customers are attracted to the keyless accessibility and the ability to connect their hardware to their security systems and smart phones. Unfortunately, our gates are typically exposed to conditions harsher than those that many of these systems are designed to withstand. Below you can see a variety of coded door hardware that Garden Passages can offer to our customers and that our customers can purchase separately for use in their new custom wood gate. Garden Passages Custom Wood Gates can only accept hardware that uses a standard (typ. 2 1/8″) cylindrical bore. We cannot accept mortise based lock systems. 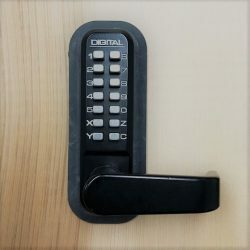 Please also be sure that the hardware you order fits the thickness of your new gate (1 3/4″ in most cases) and that it is handed correctly (Right or Left Hand). If you are not 100% confident in your selection please call us before ordering hardware for your new gate. These options are supplied directly by Garden Passages and are eligible for the warranty included with your new custom wood gate purchased. These versions of coded door hardware come in multiple colors and can have coded releases from one or both sides. This hardware uses a combination of springs and magnets, meaning there is no battery replacement required throughout the life. Overall, our customers report that these have the most durability of the coded options. The downside for these are the limited number of codes (1) usable at a time and the added work required to change the code. Contact Garden Passages for options and to order these items for your new gate. These options must be purchased outside of Garden Passages and made available to the installers at the time of install to be added to your gate. These gates combine the coded functionality and latching functionality needed to secure your door and automatically stay shut. Please note that these options are rarely considered pool safe and must be used in conjunction with other items to meet most pool safety requirements. These options are often considered to be more decorative are among the most popular choices of our customers.